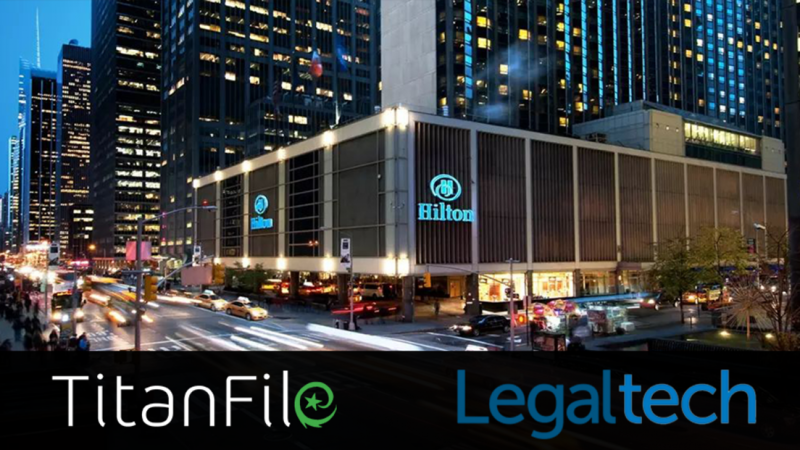 TitanFile Inc., a secure file sharing and correspondence solution provider for many of the top law firms in the U.S. and Canada, announces their attendance at Legaltech – the largest and most important legal technology event of the year. The conference will be held from January 28th – January 31st at the New York Hilton Midtown Hotel. During the 4-day trade show, many legal professionals will gather to get hands-on information about the latest and most relevant technologies to help them better adapt to the rapidly-changing technological landscape. Technology solutions providers will have the opportunity to share their knowledge and solutions with different law firms. A few featured keynote speakers scheduled to speak at Legaltech are Alberto Gonzales and Loretta Lynch, two former Attorney Generals of the United States who will cover leadership in the profession of law and how it’s changing, and Brian Kuhn, the Founder and Global Leader of IBM, who will be joining in to demystify AI for business and the practice of law. To join in on this valuable opportunity to network and potentially form new partnerships, register for Legaltech on their registration page. As an annual attendee and supporter of Legaltech and its community of like-minded legal professionals, TitanFile is looking forward to sharing their knowledge and experiences of sharing confidential data on the cloud and keeping it secure. TitanFile’s president, Dr. Tony Abou-Assaleh, and director of sales, Mr. Victor Abou-Assaleh, will be on the Legal LITE Stage giving an educational presentation about Secure File Sharing and Client Collaboration in 2019 on January 30th between 2:40pm – 3pm. TitanFile will be announcing a new update to their secure file sharing platform which will integrate a built-in PDF viewer and include support for single sign-on authentication with Azure Active Directory and AWS Directory service. More details on how to find TitanFile at Legaltech here. TitanFile is an award-winning secure messaging and file sharing platform for external correspondence among attorneys, support staff, clients, and other professionals. TitanFile is as easy to use as email, resulting in increased efficiency, cost saving and higher customer satisfaction while improving security and compliance. For more information, please visit www.titanfile.com, or call us at 1-855-315-6012.